A Jumar is an ascender, a mechanical device used for ascending a rope. It's faster, stronger and safer than using a prussic knot. It slides freely in one direction on the rope, but grips tightly when pulled in the opposite direction. So as you move up the rope you push it along, but if you fall it will grab the rope and hold your fall. 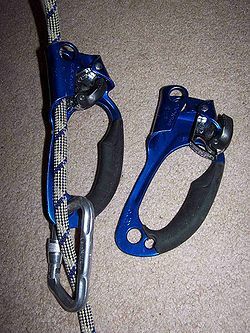 The ascender on the left is rigged for ascending. The one on the right is open. The ascender is attached to my harness by a sling and then clipped onto the rope and locked.